Results: Electronics Engineer April 2017 Board Exam (List of Passers, Topnotchers, Performance of Schools) - Balita Boss! 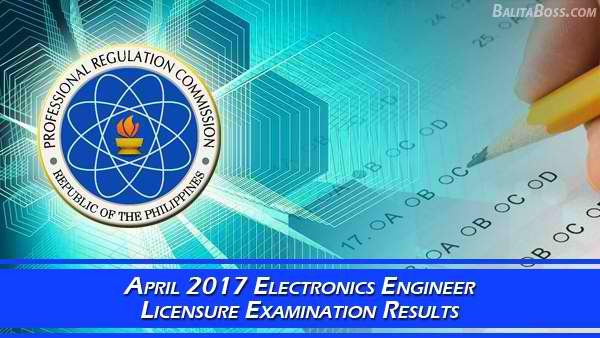 The Professional Regulation Commission (PRC) released the official results of April 2017 Electronics Engineer Licensure Examination on Friday, April 7, 2017. The examination was conducted by the PRC on April 2 and 3 in Manila, Baguio, Cebu and Davao. A total of 1,033 out of 2,503 examinees passed the April 2017 Electronics Engineer Board Exam, according to PRC (via PRC Website). AARON MACA-AYONG POLANCOS, a graduate of MAPUA INSTITUTE OF TECHNOLOGY-MANILA, ranked first in the April 2017 Electronics Engineer Board Exam with a rating of 88.80 percent. To download the April 2017 Electronics Engineer Board Exam Topnotchers, please click here or here. To download the April 2017 Electronics Engineer Board Exam List of Passers, please click here or here. To download the April 2017 Electronics Engineer Performance of Schools, please click here or here. MINDANAO STATE UNIVERSITY-ILIGAN INSTITUTE OF TECHNOLOGY emerged as the top performing school in the April 2017 Electronics Engineer Board Exam as per Commission Resolution No. 2010-547 series of 2010, with 88.89 passing percentage or 24 out of 27 examinees passed the exams. Electronics Engineer board exam covered the following subjects: DAY 1 - Mathematics (20%) and Electornics Engineering (30%); DAY 2 - General Engineering and Applied Sciences (20%) and Electornics Systems and Technologies (30%). The Board of Electronics Engineering who administered the Electronics Engineer Board Exam are Engr. Alnar L. Detalla as Chairman, with members namely Engr. Enrico Claro R. Delmoro and Engr. Herminio J. Orbe. During the last examination conducted last October 2016, a total of 1,914 out of 4,742 examinees passed the Electronics Engineer board exam, PRC announced. Thank you for reading. Please follow Balita Boss on Facebook, on Twitter or on Google+ to receive updated information about the Electronics Engineer Licensure Examination.